Hi Everyone!!! I am so glad you stopped by today to see what I am up too! The Xyron Design Team is hopping with Newton's Nook this week!!! I am so excited since this is the first time I have used their stamps and I can tell you now this won't be the last. Today I created a set of 6 CAS Card Set to gift to one of my aunts. The Happy Little Thoughts Stamp Set is the perfect set since you can create multiple cards with one layout design. 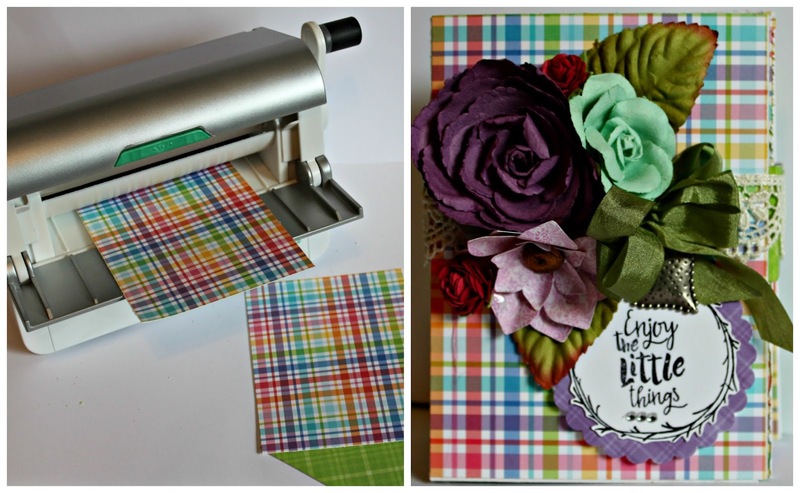 I began my cards by first cutting all my pieces on the Swingline Classic Cut Lite Guillotine. 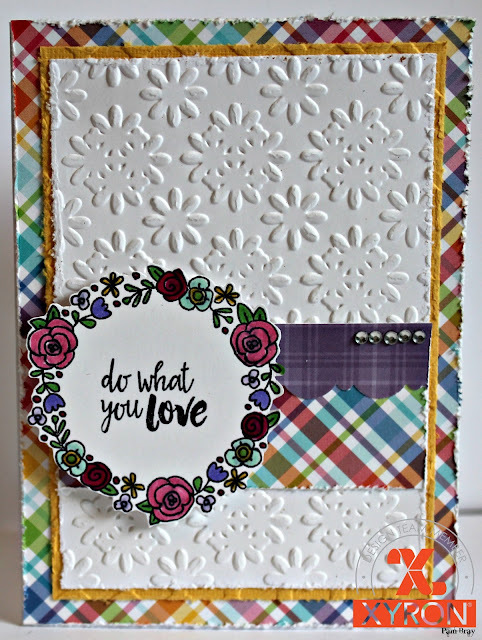 Begin by first layering all your pieces together; border punch a piece of the pattern paper to go along with each stack. Distress all the paper pieces with your distress tool. 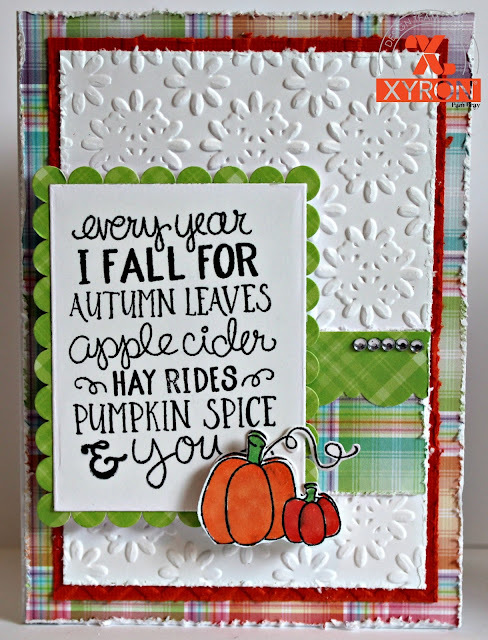 Emboss the mats with embossing folders prior to adhering them together with your Xyron Tape Runner. Adhere pieces together with Xyron Tape Runner. 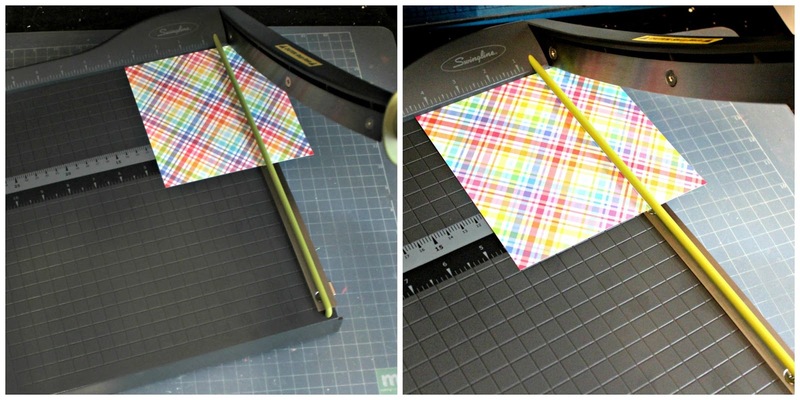 Place the scallop border through the Xyron 1.5 Sticker Maker; add to front of small mat. Create your 6 card fronts. Stamp Newton's Nook Falling For You Stamp Set and Newton's Nook Happy Little Thoughts on white paper with black ink. Color stamped images with markers. 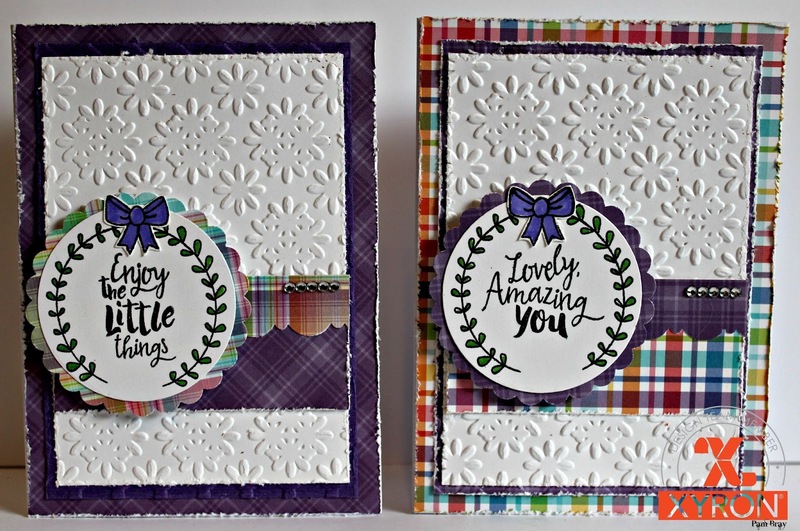 "Enjoy the Little Things" and "Lovely Amazing You"
"Think Happy Thought" and "Celebrate Today"
COMPLETE SET OF 6 CARDS! Once I had my cards created I decided I need to make a cover set for them. So I cut two pieces of chipboard and pattern paper; ran them through my Xyron Creative Station Lite using 5" Permanent Adhesive. Cover the chipboard with the adhesive paper. Adhere to a pattern paper strip that will fit around the stack of cards. Stamp "Enjoy the Little Things" on white paper along with the wreath from Newton's Nook Happy Little Thoughts. Add to front of prepared cover with pop dots. Add gemstones. stop by and check out my talent Xyron teamie Maria to see what she has created today. Oh my!!! Love your beautiful project!! !All your cards are adorable!!! Beautiful set of cards. And thanks for the step-by-step instructions! colors in the paper. Great cards. I would love a set of cards like this! BEautiful! 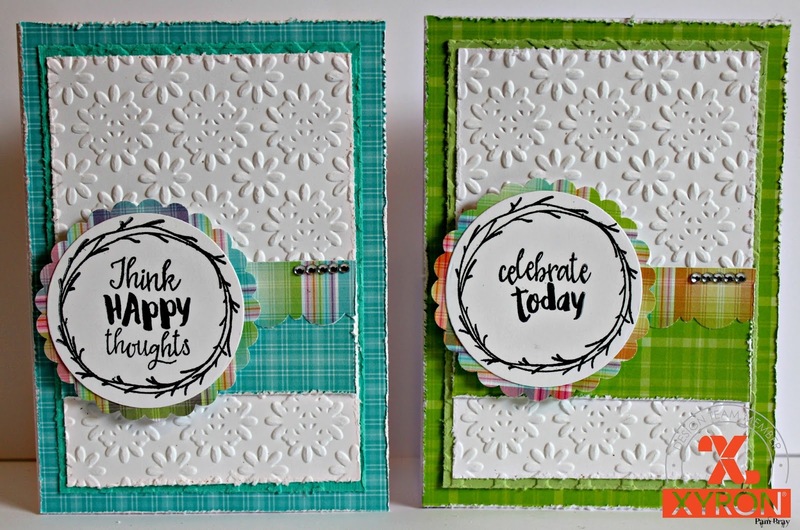 Love the cheerful look of these cards!!! I really love the wreaths. They can be used all year long--so pretty. This card set is so lovely! It will make an amazing gift! I also really enjoyed how you shared your process for creating these cards! Such a fun post! Thanks for being a part of our Collaboration this week! Love all the cards. They are outstanding. Thank you for sharing. What a fantastic collection!! Love this fun little set and you have shown it off beautifully! Absolutely lovely! Such a thoughtful gift! What a fabulous gift set! Love the shabby-chic look and the flowers to top 'em off! So beautiful! 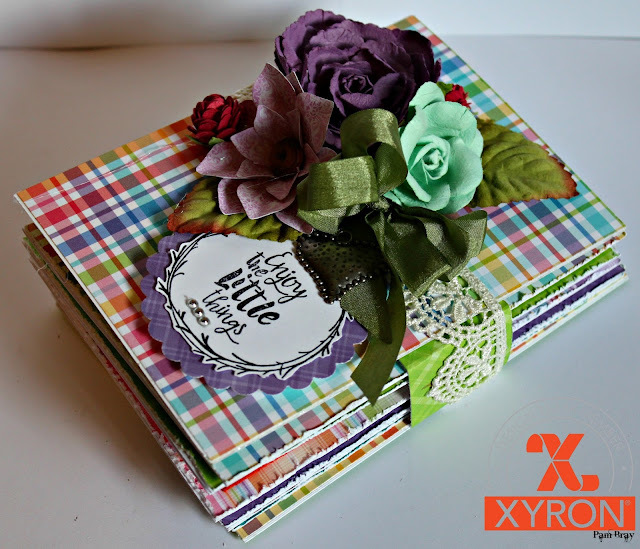 The cover with floral & heart embellishments make it an EXTRA special gift!